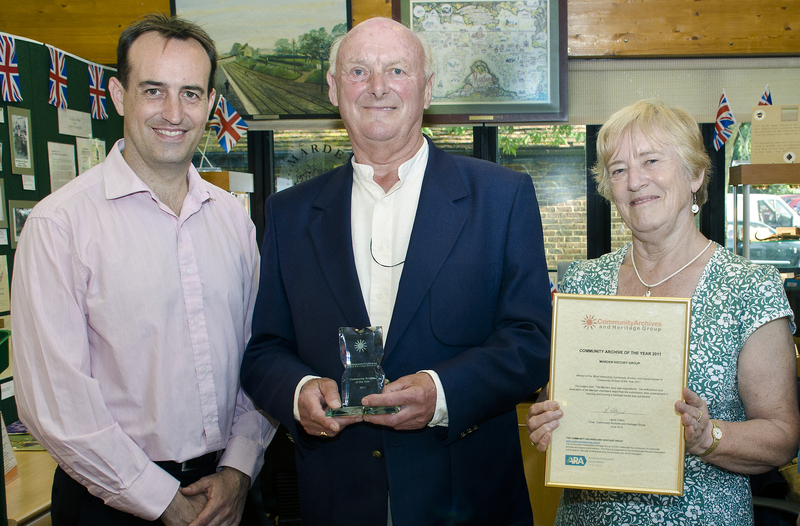 Dr Nick Barratt presenting the Community Archive of the Year Award 2011, in Marden, to David McFarland and Eurice Doswell of the Marden History Group. A Heritage Centre in the village of Marden, Kent, has been named Community Archive of the Year. The announcement was made at the Community Archives & Heritage Group Sixth Annual Conference on Wednesday 27 June. The award was presented to the group at a special event in Marden by Dr Nick Barrett, academic, researcher, media presenter and member of the Community Archives and Heritage Group Committee. Six UK community archives won prizes under the awards, with Marden being awarded the overall ‘Community Archive of the Year’ award. ‘We’re just a village, but we believe we may be the only such centre in the UK to operate in this way and be open for 18 hours each week’ says Marden History Group Chair David McFarland. The Group had been gathering artefacts and historical records about the village for a number of years. A key piece of work undertaken was research into a hoard of bronze weapons, tools, ornaments and metal working debris buried in an urn in what is now the parish of Marden nearly 3000 years ago. The Marden hoard is one of the earliest Bronze Age ones found in Kent. ‘The Marden story was inspirational’ said Laura Cotton, Chair of the Community Archives and Heritage Group and of the competition judges. ‘The enthusiasm and dedication of the Marden volunteers leapt from the submission; their achievement in opening and running a heritage centre was substantial’. Marden History Group are the inaugural winners of the only national award for Community Archives. The awards are run by the Community Archives Heritage Group and supported by the Archives and Records Association (UK & Ireland). There were 63 submissions to the Community Archives and Heritage Group awards for 2011. The judges praised the high quality of the submissions. The Planned Environment Therapy Trust undertook an oral history of residential therapeutic child care from 1930 to 1980, recognising that for many children and young people the loss, invisibility and inaccessibility of records about them translates into a corresponding lack of personal foundation and certainty. The judges praised this ‘very real project’ for the significant outcomes it had achieved.